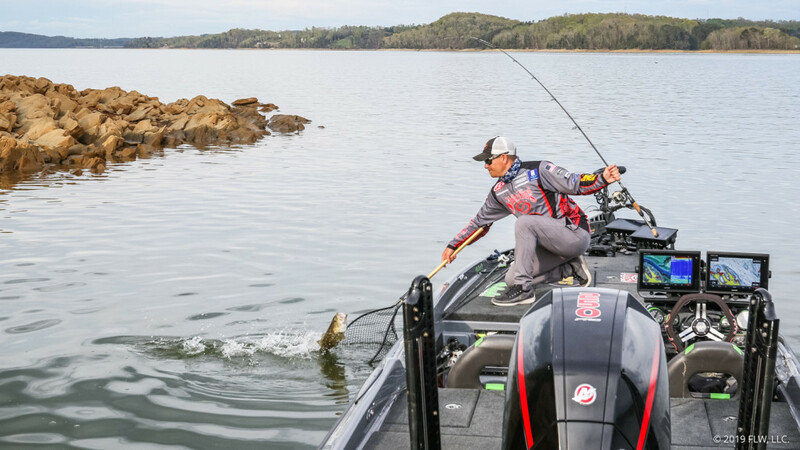 JEFFERSON CITY, Tenn. (April 12, 2019) – Pro Andrew Upshaw of Tulsa, Oklahoma, is still on top at the FLW Tour at the Cherokee Lake presented by Lowrance after catching five bass weighing 17 pounds, 14 ounces. Upshaw’s two-day total of 36-4 will lead the final 30 pros into the third day of the event, with pro Dylan Hays of El Dorado, Arkansas, in second with 34-8 and Lowrance pro Austin Felix of Eden Prairie, Minnesota, right on his heels in third with 34-5. With weights this close together, there is sure to be some movement on the leaderboard heading into Championship Sunday, when the final 10 pros will take the water with their sights set on the top award of up to $125,000. “I actually started right where I caught my last big one yesterday. I went through the exact same spot and I caught a 4½- and a 2¾-pounder,” said Upshaw, who is fishing in his eighth season on the FLW Tour. “There was enough boats around me that I figured I better stay in there and catch my limit, so I went ahead and caught a limit of 2½-pounders and the one big one. 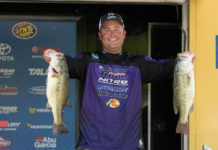 Upshaw said he caught more keepers Friday than he did Thursday, and again brought all smallmouth to the weigh-in stage. Heading into the weekend, Upshaw said he has a couple of options for catching fish. Hensley Powell of Whitwell, Tennessee, earned the $500 Big Bass award Friday after bringing a bass to the scale weighing 5 pounds even – the heaviest fish of the day. Overall there were 786 bass weighing 2,120 pounds, 13 ounces, caught by 162 pros Friday. The catch included 147 five-bass limits. In FLW Tour competition, the full field of 164 pro anglers competed in the two-day opening round on Thursday and Friday. The top 30 pros based on their two-day accumulated weight now advance to Saturday. Only the top 10 pros continue competition Sunday, with the winner determined by the heaviest accumulated weight from the four days of competition. The total purse for the FLW Tour at Cherokee Lake presented by Lowrance is more than $860,000. The tournament is hosted by the Economic Development Alliance, Jefferson County. Anglers will take off at 7 a.m. EST Saturday and Sunday from the TVA Dam Boat Launch, located at 2805 N. Highway 92, in Jefferson City. Saturday and Sunday’s weigh-ins will be held near the launch beginning at 4 p.m. In conjunction with the weigh-ins, FLW will host a free Family Fishing Expo at the TVA Dam Boat Launch from 2 to 6 p.m. on Saturday and Sunday. The Expo is a chance for fishing fans to meet their favorite anglers, enjoy interactive games, activities and giveaways provided by FLW sponsors, as well as learn more about the sport of fishing and other outdoor activities. Also for youth, the FLW Foundation’s Unified Fishing Derby will be held at the TVA Dam Boat Launch on Saturday, from Noon-2 p.m. 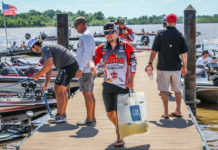 The event is hosted by FLW Foundation pro Cody Kelley along with other FLW Tour anglers, and is free and open to anyone under the age of 18 and Special Olympics athletes. Rods and reels are available for use, but youth are encouraged to bring their own if they own one. The 1st and 2nd place anglers that catch the most fish will be recognized Saturday on the FLW Tour stage, just prior to the pros weighing in. Television coverage of the FLW Tour at Cherokee Lake presented by Lowrance will premiere in 2019. The exact air-date will be announced soon. The Emmy-nominated “FLW” television show airs each Saturday night at 7 p.m. EST and is broadcast to more than 63 million cable, satellite and telecommunications households in the U.S., Canada and the Caribbean on the World Fishing Network (WFN), the leading entertainment destination and digital resource for anglers throughout North America. 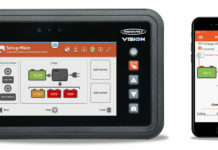 FLW television is also distributed internationally to FLW partner countries, including Canada, China, Italy, Korea, Mexico, Portugal, Spain and South Africa. The popular FLW Live on-the-water program will air on Saturday and Sunday, featuring live action from the boats of the tournament’s top pros each day. Host Travis Moran will be joined by veteran FLW Tour pro Todd Hollowell to break down the extended action each day from 8 a.m. to 2 p.m. On-the-water broadcasts will be live streamed on FLWFishing.com, the FLW YouTube channel and the FLW Facebook page.